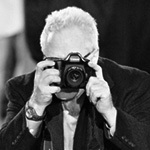 OPF is dedicated to the personal vision built into extraordinary photographs. Above all we are most concerned with what's in the image, not just the things, but also the ideas and feelings that move us. So here is the first in a series of short topics which examine how we might be embedding what we feel into our pictures. This article deals with the paradox of context: truth holds us prisoner! I. The Truth Paradox: Art Stymied By Revelation! We say that truth sets one free! That may be untrue in photography. Here's an example. Look at a picture without context and see what you get out of it. Now go to the next stage and see the image in the series showing the real world relationships. Suddenly Merlin the Magician is banished, God's hand appears to withdraw, Pan and Oberon disappear and we have the clutter of the truth! It still may be intriguing, interesting and compelling but the truth locks out all the things things could be. As you can see here, Charles Webster's first image has an indefinite magical quality of uncertain identity, but for sure magnificent. We wonder what could cause the golden columns broken by the water? Ideas of sunsets and magic times come to mind. His subsequent picture shows more context. Those same reflections are again beautiful but a different nature entirely. They come from man-made structures projecting from the water, not the wand of the hand of god as the sun is put away for the day! Similarly the initial image of the wire allows no reference to any object for scale. We see detail that corresponds to large thick metal cords powerfully bent and twisted. They show authority and certainty. We don't know why or for what but we do know that this is from the hand of man and made with a purpose. 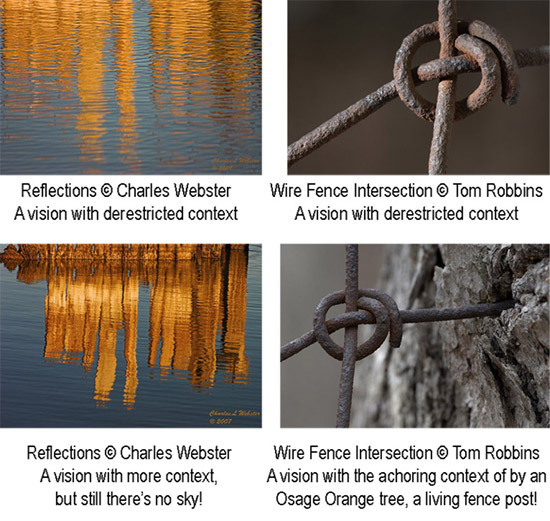 Not having full context allows us to pose and create our own meanings that transcend the ordinary nature of an isolated piece of fence wire. This, when disclosed in the second picture, changes our perceptions of the first version entirely. This is the reverse of what we do in making the cropped images in the first place. We remove and show just what we want to seduce the brain on to a path it would not otherwise venture to travel. That seduction is essentially what is embedded into a physical form of art and into every photograph that works. We are taken to an imaginary place the artist has created for us. We bring our own actors to enter that arena and remake the show in what I imagine is "The Cathedral of The Mind". Hopefully, some of the excitement of the work is reinvoked in all who see it. When that is done, the artist's intent is carried over and his or her Arc of Creative Intent is completed! This article is further discussed in Photography as Art here .